Thread: Anybody been to the Banyan Tree recently? Some relatives are staying there for 3 days in August and have asked about restaurants/breakfast in and around the hotel. Any must sees in the immediate area? I'm looking forward to trying this place. It is close by. I get into the Saffron from time to time and have never had a bad experience. ^ sounds good, thanks Fishy. I'm pretty sure they'll be trying out the inhouse restaurants. ^^ what kind of place is that MeMock? I visited the same relatives in Dubai when they were staying at a $1000 per night hotel - it was really average, and I remember telling them that the $150 per night hotels in Bkk were as good/better with much better food - hope I'm not proved wrong! The problem with the Banyan Tree is traffic. Sathorn becomes gridlocked in the evening and Fridays are practically impossible. I walked past that place the other day and wondered what it was ,now I know. Not an easy place to find though, hidden down a Soi behind Bangkok head office bank on Silom. Yeah it is a tiny little street for sure. I generally always end up staying in the area when I visit which is why I reckon I will end up checking it out. Did 'Gay Bar' cross your mind ? The place is really Weird. Its a beautiful old 2 story building painted in hideous pink. Its in a back street surrounded by piss all except local markets and its not the sort of place that will get walk in traffic. One would not walk down that Soi at night unless one had a reason. In the day the area is inhabited by office workers mainly. See how long they last before they go broke. 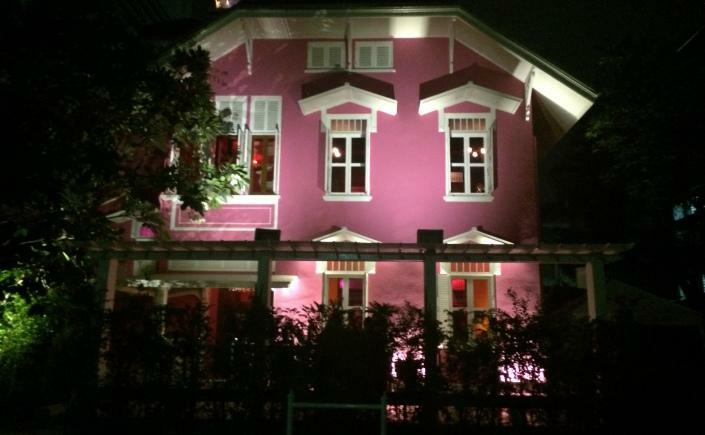 Eat Me in soi convent is excellent, but book ahead. Fridays and Saturday nights at Radio City for Elvis and Tom Jones live arr always good fun. They have a Chinese one on the top floor with amazing views over the river, thought the grub was horrible though. That was 2002. Blue Elephant is not far that's nice. I didn't mention the Chinese restaurant, but it used to be a favourite of mine. Even had a piano. The last time I did the Chinese, in 2004 or possibly 2005, it had been moved down a few floors with desperately irritating, typically Thai, recorded music. I think we were treated to Puff the Magic Dragon if I remember correctly. I had some friends staying in a suite there back in March. Very good, and the club room has free piss unlimted as well (which we took full advantage of). a few of the places on this list are out but most still open. Fairly good list though. I would recommend Lebua Sky bar - even if they just go for a drink they will not be disappointed.